The most premium construction in the Lithium range, the Lithium Core uses the Teijin Technoforce D2 Double Rip Stop Canopy and our exclusive Dyneema Load Frame with WebTech, a combination that making this kite by far the strongest kite we have ever designed. For riders who spend countless hours on the water, the Lithium Core construction is ideal. The Single Point System on the Lithium Core features a XL Boston Inflate/Deflate valve making inflation effortless. While the V3.1 Bridle improves the steering when overpowered or sheeted out, ideal for Wave riding or riding more powered up. The focus of wingtip and strut layout in conjunction with the Delta Hybrid design ensures the quickest response through the air as well as instant relaunch. With amazing park power, stability, and ease of use, the Lithium is simply the perfect kite. Included in this premium construction is the Deluxe Poly Bag using recycled materials. This bag has ample amount of features and pockets to keep everything organized, accessible, and clean. The Lithium is one of the longest running models in the industry, marketed as an entry level all around freeride platform good for progression. This year Airush is offering the Lithium in three different trim levels that vary a bit on construction materials, bridling and probably most appealing, price. The Core is the premium level with the highest quality canopy construction and bridle options, but it’s worth noting that while the Progression SPS and Progression share the Progression name, they use different canopy fabric and the regular Progression requires all struts and the leading edge to be inflated separately via a 9mm valve. The Lithium’s 3-strut delta shape sports a low/medium aspect platform. Both the Core and Progression SPS options give you three wingtip settings for adjusting bar pressure, but the Core offers you two settings for the front bridle while the Progression SPS model has a single setting non-adjustable bridle. Both models have a large flow Boston valve that requires the larger inflation nozzle for a quick inflate. The bar’s lines feature center lines that end in knots and outside lines that end in loops. The Lithium features medium plus bar pressure, not the lightest but certainly not the heaviest, along with middle of the road turning speed—we found the response was good, not lightning quick scary, yet not slow by any means. The Lithium has very good relaunch with an almost automatic launch from the bottom of the window which is great for someone who is a little tentative when it comes to crashing kites and the basics of relaunch. In terms of comparison between the Progression against the Core, it seems as if the Core model with its extra Dacron and load bearing frame is a little bit more responsive. 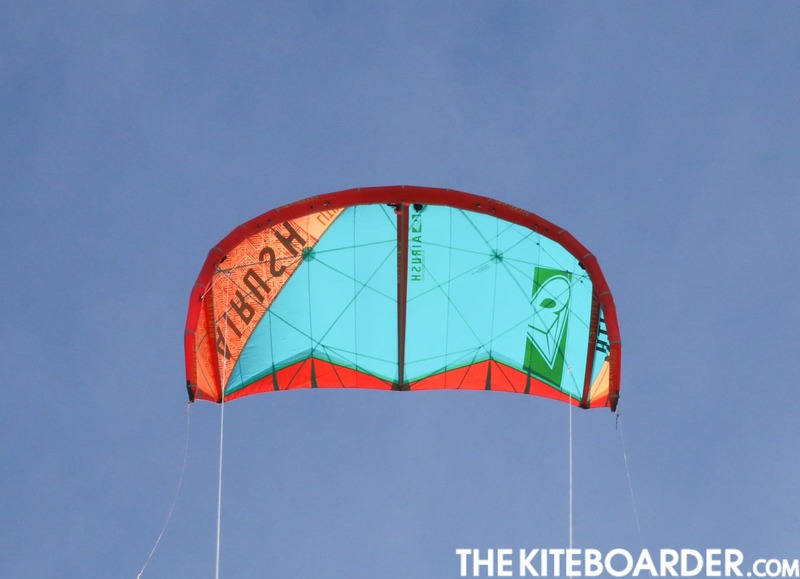 While it may not be apparent to all kiters, there is an argument to be made that the Core canopy seems to offer a slight improvement in turning response and a sheeting feel that is a hair bit more crisp with better acceleration. While opinions may differ, we found the Core to be a little more fine-tuned for performance. 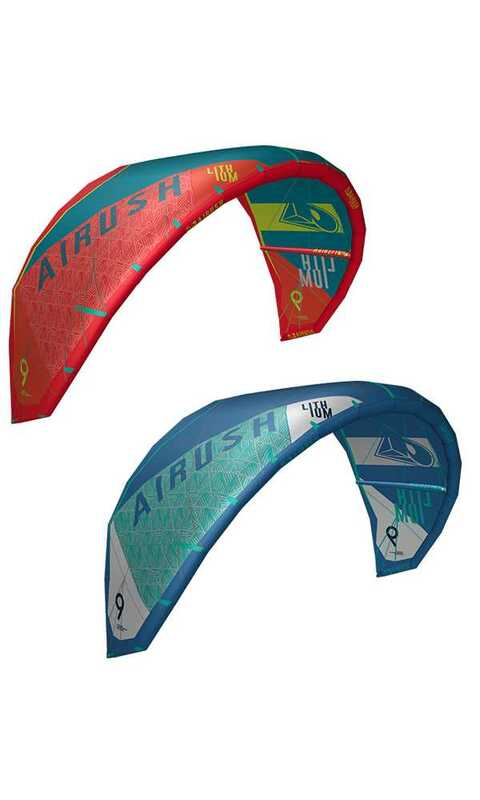 While the Lithium shape is by no means an advanced performance kite, if someone wants a little more performance out of Airush’s all around user-friendly freeride kite, the Core might be a good upgrade. Generally, the Lithium offers solid lift, turning and upwind ability in a very predictable and user-friendly package. The Lithium is a very intuitive and fun all around kite that will work for entry level riders as well as all around freeride kiters that cross between the world of cruise, waves and big air freestyle.